Boulder County / Safety & Law / Victim & Witness Support / Restorative Justice / C.A.M.P. We are a volunteer driven mediation program in the Boulder County Sheriff’s Office offering free mediation services to settle disputes for individuals living within Boulder County but outside the city limits of Boulder or Longmont. Mediation services provide a safe environment for people in conflict to come together to create their own agreements. This site describes who we are, what we do, and how to contact us. Benefits of Mediation: Why should I choose mediation? How do I start the mediation process? I want to participate in mediation. What do I do? The Community Assistance Mediation Program (CAMP) grew out of the realization that there was a lack of no cost mediation services available to individuals in need living in Boulder County, yet outside larger city limits already offering mediation services. Mediation is appropriate for many types of disputes if everyone involved is open to finding a resolution. Referrals are accepted from our Deputies, the Courts and the community. CAMP began offering mediation services in November, 2010. Our mediation services are available for all disputes except landlord/tenant. While our mediators have been professionally trained, we do not specialize in family law. The appropriateness of these cases for our program will be decided on a case by case basis. Our mediation program is staffed by a group of professionally trained volunteers and is directed by a paid coordinator. The mediators come from a variety of backgrounds and have vast professional experience. All mediators have completed specialized mediation training and have demonstrated their success in resolving disputes. The mediators are neutral and impartial and do not represent or advocate for either party in the dispute, nor do they offer legal advice. Mediation is a voluntary process that provides an opportunity for people in conflict to come together to create their own agreements. A neutral team of two mediators helps disputing parties clarify issues and consider options. Mediation takes place in a safe and positive environment. Everyone’s point of view is considered through open, honest and respectful communication. As the result of facilitated discussions, a workable agreement is reached and put into writing. We cannot mediate separation, divorce or custody cases, or landlord/tenant issues. Mediation: Parties come together to meet face to face in a safe environment. The mediation process is structured to provide the opportunity to talk, listen and to effectively communicate the issues. Agreement: When parties come to an agreement on how to settle a dispute, the agreement items are written on a mediation agreement and signed by the parties. This is a legally binding agreement and can be presented in court if either party chooses not to abide by the agreements. Client statements – each party explains the situation from his or her perspective without interruptions. Flexible – mediation is conducted at a convenient time and place for everyone involved. The CAMP coordinator will contact you after a referral is received. If mediation is agreed upon by both parties, the mediators will contact each party to set up both a preliminary meeting and the mediation. Volunteer mediators must have successfully completed a professional 40 hour mediation training to volunteer for our program. All volunteers commit to joining a team for at least one year. The teams generally meet once a month for 2 hours to debrief cases, review new policies, or for in-service training. It all starts with your interest, an application, an interview and an introductory training. 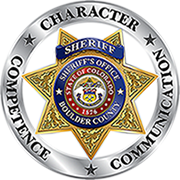 If you are interested in volunteering as a mediator, please fill out the Boulder County Sheriff’s Office volunteer application and submit to the BCSO Restorative Justice/CAMP office. Positions open periodically, so check back if there are currently no volunteer opportunities available.